Marin Country Mart has announced an array of lov-ely activities and promotions to celebrate Valentine’s Day. Under the theme of ‘Marin County Mart is for Lovers,’ February festivities include great holiday events for families and adults, seasonal offerings from merchants, and special dance and music events. While some Valentine specials are available to enjoy in early February, holiday activities reach their peak on Saturday, February 13, and Sunday, February 14. 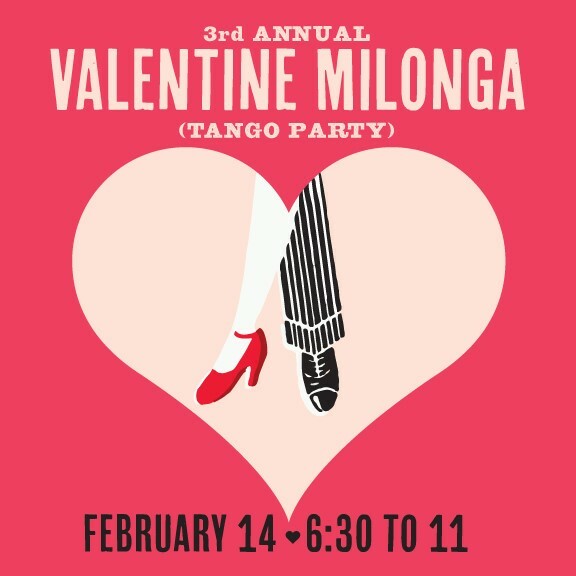 Back again because of its sell-out popularity last year, the 3rd Annual Valentine Milonga (Tango Party) encourages adults to put on their dancing shoes and tango attire. Full of stirring music and dance, this exceptional event welcomes visitors on Sunday, February 14, from 6:30–11 pm in the heated Big Tent, rain or shine. The party features a concert by Redwood Tango, a tango lesson and tango performance by noted instructors Jonathan and Olivia, and milonga with live and DJ music. Admission to the Valentine Milonga – the event, tango lesson and dancing – is complimentary with a minimum purchase of two tickets for food or drink for $20 on Brown Paper Tickets. To further enhance the evening, a special tango menu by Rustic Bakery is also available, featuring sweet and savory items, beverages – and a red rose, a tango signature! Information and ticket options to reserve a spot by February 10 are available at: http://www.valentinetango.brownpapertickets.com. Once again this year, the Rose Cottage doors are open on February 13 and 14, where dozens of roses are in bloom to delight one's honey – all at very reasonable prices, ranging from $45–15. At the Trading Post on Saturday and Sunday, a vintage photo booth offers complimentary pictures that capture the Valentine spirit. To commemorate the occasion in verse, Vanessa Rose, the ‘Bardess of Love,’ composes personalized, on-the-spot poems on both days. Lovely music is featured throughout the weekend. In addition, many merchants, services and eateries feature offerings focused on the Valentine holiday. Some of the holiday’s special events are geared specifically for children: on February 11 Poppy Store welcomes Emily Butterfly for story-telling and snow globe making, plus Valentine cupcake decorating. 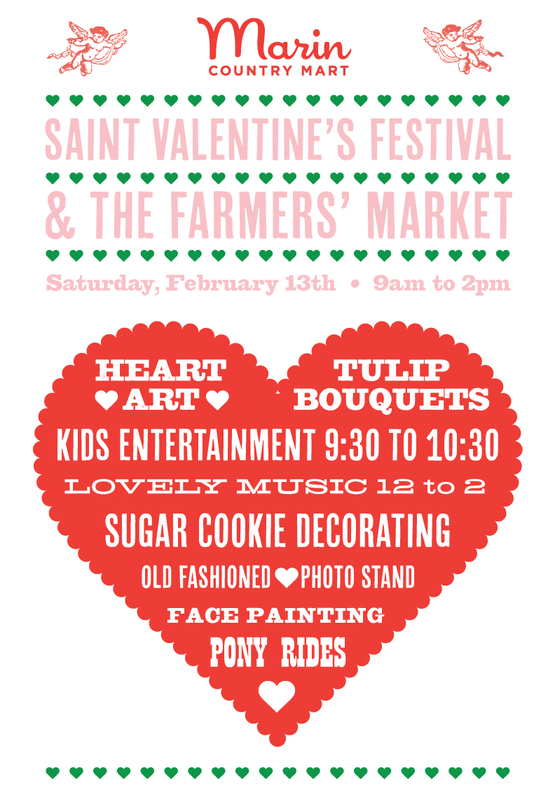 On Saturday, the Farmers’ Market features its Saint Valentine’s Festival, with family fun from 9 am–2 pm. Among its many activities are sugar cookie decorating, a heart art project, poetry from the Valentine poet, music and more – plus shopping for delicious local wares, including beautiful tulip bouquets. Come share the love at Marin Country Mart! Located in the Courtyard, the Rose Cottage offers a wide selection of the highest quality roses. Choices include one dozen long-stem roses ($45), one dozen short roses ($35), one dozen spray roses ($25) and potted roses ($15). During the day, the Bardess of Love shares her sonnets. Our 3rd Annual Valentine Milonga tango party takes place at Marin Country Mart under the heated Big Tent, rain or shine, starting with an opening concert by Redwood Tango from 6:30-7:00 pm. From 7:00-7:45 pm, an absolute-beginner tango lesson is given by Jonathan Yamauchi and Olivia Levitt, noted Bay Area tango instructors. All visitors are welcome in the class (and experienced dancers are encouraged to come and help the novices). Dancing continues for everyone from 8:15-11 pm with recorded and more live music by Redwood Tango. A break at 9:30 pm showcases the dance as done by experts, with featured performances by Jonathan y Olivia and Christopher y Caroline in the milonguero style of tango. Adding to the evening’s pleasure, a special tango menu by Rustic Bakery is also available, with food and drink tickets purchased in advance with the event ticket. Choose among sweet and savory fare (kale & romaine Caesar salad, Argentinean-style empanadas, grilled steak sandwiches with chimichurri sauce, or a Valrhona chocolate brownie for two), and beverages (red or white wine, Pellegrino, or a fresh-fruit punch) – plus a red rose, a tango necessity! Admission to the Valentine Milonga (the event, tango lesson and dancing) is complimentary with a minimum purchase of two tickets for food or drink on Brown Paper Tickets at: http://www.valentinetango.brownpapertickets.com. Tickets should be reserved by February 10. Throughout the weekend, musical groups serenade visitors with songs of love, both lost and found. On Friday, February 12, enjoy Friday Night Jazz under the Big Tent from 5:30-8:30 pm; on Saturday, February 13, Rich Armstrong with the Cupid’s Arrow Trio featuring Lakshmi Devi from 2-4 pm; on Sunday, February 14, The Battlefield from 12:30 to 2:30 pm, and Redwood Tango kicks off the milonga at 6:30 pm. Celebrate Saint Valentine’s with the whole family at the Marin Country Mart Farmers’ Market, on Saturday, February 13. Festivities include, sugar cookie decorating, a creative reuse heart art project, an old-fashioned photo stand, face painting, pony rides, and live music. Also, enjoy shopping for delicious Farmers' Market yummies for a sweetie, like organic and locally grown tulip bouquets, candied walnuts, pastries and doughnuts and jams. As always, weekly kitchen staples at the farmer's market are also available, including organic greens and root vegetables, citrus and apples, artisan cheese, pastured eggs and meat, Oregon crab, and artisan breads. Get fit and healthy while cultivating joy, compassion and unconditional love for oneself and others with 14 days of yoga! Attend one class per day at a YogaWorks’ location or stream a class on MyYogaWorks.com. Feel amazing, win great prizes from our sponsors, and raise funds and awareness for women's heart health. All are invited to join the challenge, which runs February 1-14. Children are invited to Poppy Store to join Emily Butterfly for a puppet show and story time (4-4:45 pm) and snow globe making (4:45-5:45 pm). There’s also Valentine cupcake decorating from 4-6 pm, featuring tasty cupcakes and lots of decorations. Emily Butterfly is a magical weaver of story and song, who has been delighting young audiences for many moons with her sweet and humor-filled puppet friends. With a wave of her magic wand, she inspires great love and respect for the Earth in every show. Celebrate love and beauty in life at Erica Tanov’s special St. Valentine’s Day Event, featuring a selection of jewelry and handcrafted leather accessories by Los Angeles designer Mara Carrizo Scalise; and lush seasonal floral arrangements by Mill Valley floral designer Rito-Ito. SoulCycle celebrate SOULmates by letting a bestie, boo or date ride for free in the Sunday, 4 pm class. Just book a bike in class and call the studio to book a SOULmate. Offer valid February 12-28. Roberta Roller Rabbit collections are inspired by exotic, travel-inspired patterns. Their journey continues and, with each collection, a new chapter begins. For this Valentine's Day, they present a complete hearts and kisses collection. Seeking sweet treats for a sweetie? Rustic Bakery features its Valentine's Day gift collections – two bountiful baskets that are sure to delight. The "Sparkling Lover" basket offers a gorgeous California sparkling with decadent treats, including Rack & Riddle North Coast Brut méthode Champenoise, Michael Recchiuti champagne truffles, Rustic Bakery almond cacao nib cookies and fluted crystal sugar hearts ($75). The "Pinot Lover" basket is another delectable option. Also available are old-fashioned cookies – hand-cut and hand-decorated – including pink & red "Velvet Hearts," mini-sweetheart chocolate & vanilla butter cookie bags, vanilla & chocolate shortbread hearts dipped in El Rey chocolate, and more. Mini sweetheart cookies in a glass jar are tied with a raffia bow and a gift tag. Seasonal bread – dark cherry & chocolate levain – is available in early February. For a calorie-free Valentine treat, choose BKR water bottles in pink, red, white with a heart motif and black with a heart motif. In the butcher shop, Belcampo offers special ‘Love, Oregon’ wine, a pinot noir mostly from Willamette Valley; and chocolate goodies. On February 13 and 14, they will feature filet mignon for ladies with a delicate appetite and a 20 oz. bone-in ribeye for the manly men! A special Valentine’s Day promotion at Pressed Juicery from February 8-14 features a free Compartés chocolate with a purchase of a $30 Gift Card. Looking for something sweet for a honey? In addition to the usual Valentine's Day flavors such as Bittersweet Chocolate, Cherry Chocolate Chunk, Land of Milk & Honey and Raspberry Sorbet, Three Twins offers special flavors such as Strawberry Confetti (strawberry ice cream with chocolate chips) and Honey Orange Blossom. Please note: Calendar is subject to change. For the most current information and details on these events, please visit: marincountrymart.com/calendar. Marin Country Mart is located at 2257 Larkspur Landing Circle, Larkspur, CA 94939. Parking is free. Additionally, parking on weekends and nights is available at no cost at the Larkspur Ferry Terminal Building, just a short stroll over a pedestrian bridge from Marin Country Mart. For more information, contact us by phone 415-461-5700, email at marketing@marincountrymart.com or online at http://www.marincountrymart.com. In 2009, J.S. Rosenfield & Co. purchased Larkspur Landing, transforming it into Marin Country Mart through extensive upgrades and new retail offerings with independent brands that better reflect the preferences of residents and visitors. The open-air shopping destination, comprised of 12 barn buildings and over 173,000 square feet of space, features appealing boutiques, dining options, services and special events (see purveyors below). Marin Country Mart has two sister venues in Southern California, Brentwood Country Mart and Montecito Country Mart, which are favorites among residents for exceptional shopping and dining. All are conceived with a spirit of community in mind, as lively gathering places that evoke simpler, more gracious times. Inspired by the idea of the village square, Marin Country Mart is a welcoming destination where local residents and visitors enjoy talented artisans and entrepreneurs who ply their trades with pride and skill, in a congenial environment shared with families, neighbors and friends.